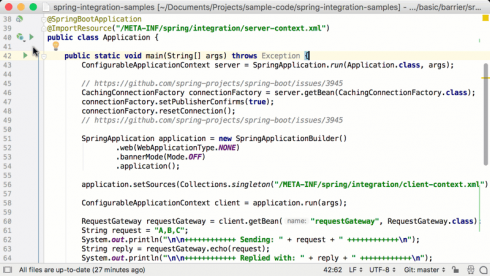 The latest version of IntelliJ IDEA is out with further support for developers using the Spring framework. IntelliJ IDEA is the professional Java IDE developed by JetBrains. Version 2018.2 now includes support for Spring Integration 5.x. According to the company, users will be able to visualize components in the system using the Spring Integration Diagram, which shows the gateways, channels, and bridges that have been configured for the application. The Run Dashboard has also been updated to now show the runtime dependencies of a Spring Boot application and adds a toggle button that can be used to show or hide library beans. HTTP request mappings can now be run, edited, and tested in the Endpoint tab. The Endpoints tab also now allows plugin developers to contribute new tabs under the Endpoints tab. This release also adds a number of smaller fixes and improvements, which can be viewed here. Other features of the 2018.2 release include improved Reactor support, a new Kotlin plugin version 1.2.51, updated JDK and fixed false positives in the Blocking operator call.